One would expect the opening of a new property of the Taj chain of luxury hotels to be a much trumpted affair. But when the latest addition to the fold of India Hotels Company (the holding company of the Taj Group) opened its doors a few days ago at Technopark, the pomp was missing. In fact, there was only a low-key ceremony with the Tourism Minister doing the honours. 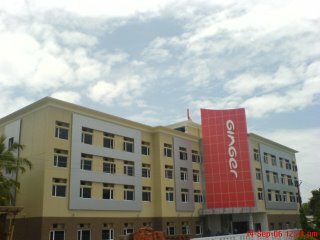 "Ginger" as the brightly adorned hotel is called is one of the first of the "no frills, business hotel" chain that IHC is setting up. In this age of "no-frills", IHC is also jumping on the bandwagon. Like its inaugration, the Ginger brand is also unassuming. According to the website, "The guiding principle behind Ginger™’s concept is the focus on key facilities that meet the key needs of the traveler. Ginger™ provides consistent, clean, convenient, quality accommodation with friendly service at affordable prices." A typical Ginger hotel features minimal staff and lets the guest serve himself at the restaurant (appropriately called "Square Meal"), iron his own clothes and use vending machines for most beverages. It is targeted at the single, business traveller and features hi-tech features like LCD TVs and Wi-fi. Interesting concept. They claim that most hassled business travellers don't have either the time nor the inclinations to enjoy the finer points of luxury at a top-end hotel. Being a very hassled and frequent business traveller, I tend to agree. I get into the room and then crash, not much time to spare to enjoy the jacuzzi or the plush curtains. :-) For all those who just require a roof over their heads, a good bed and a well appointed bathroom, Ginger looks like the right choice. The IHC guys have got their location right , for sure. Right outside India's biggest IT park! Technopark, the State's IT hub, has about 13,000 techies and 120 companies in it, right now. That number is all set to double in the next 18 months. This alone promises full occupancy and add to it the proximity of the International Airport and the Kinfra Apparel and Film & Video Parks. Ginger is only the first of a wave of new hotels opening up in Trivandrum. Other include the luxury Dodla International project at Vazhuthacaud, a five-star called "Capital Retreat" at Chacka, couple of five stars along the IT Corridor (projects by the Tamara Group and entrepreneurBiju Ramesh), a four star at Thirumala and so on. Ramesh is planning to set up a 5-star hotel and a 2000-seater International Convention Centre. The Tamara Group, floated by Infosys directors "Kris" Gopalakrishnan and Shibulal, has similar plans. The hospitality industry in Trivandrum is gearing up to meet the demand of the fast expanding IT, Tourism and Medical Tourism industry. Looks like the number of watering holes in town is gonna go up, ladies and gentlemen!